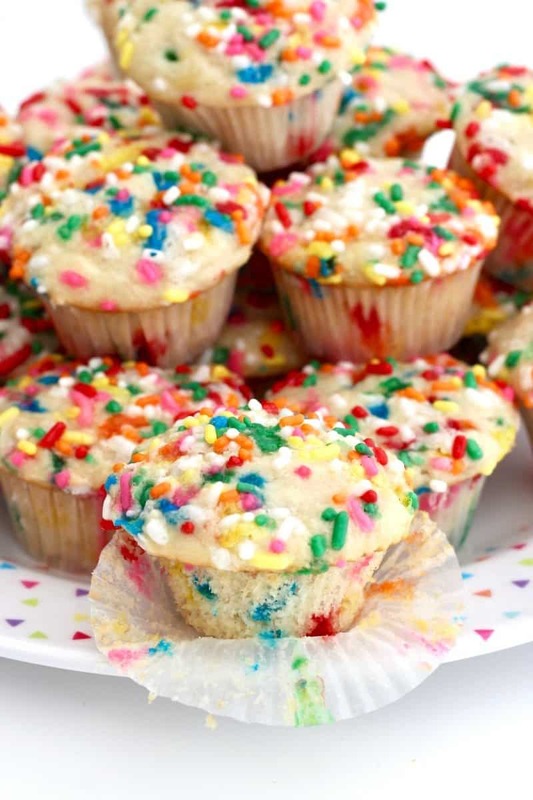 A cake mix, bananas, applesauce and sprinkles are all it takes to make these fun and yummy muffins for a special birthday breakfast! It’s The BakerMama’s birthday! No not me, but my blog! The BakerMama is officially 5 years old today! On September 12, 2012, I shared the recipe for my favorite Peanut Butter Chocolate Chunk Cookies and that’s when all the fun and yum began. I can’t believe that I’ve been sharing my love of food and life on this little blog for 5 whole years now. I say little, but truly, it’s grown into something much bigger than I could have ever imagined. And I have each of you to thank for that! Your enthusiasm and excitement for the recipes I create and share is what keeps me so inspired. I love LOVE hearing how much you enjoy making my recipes. I love how my recipes bring your family around the table or running to the kitchen when they smell my One-Bowl Fudge Brownies coming out of your oven. Or when you tag me in a picture of your kids baking my M&M Chocolate Chip Pudding Cookies with you. Or when you message me in the middle of the night while you’re nursing your sweet newborn and thank me for sharing my No-Bake Lactation Bites recipe with you because they’ve been a much needed energy and supply booster. Or when you tell me that you eat my Healthy 5-Ingredient Flourless Banana Bread almost every morning because you just can’t get enough of its healthy hearty deliciousness. Or when you tag me each time you eat a donut and say that you can’t even look at a donut without thinking of me. Hehe! Love it! Or when you email me asking for restaurant recommendations in Dallas, NYC, Chicago, Napa, San Fran, Portland, Boston…because you know Brandon and I ate our way through that city on a serious mission to find the best eats it had to offer. And last but certainly not least, when you reach out to me to chat about the ups and downs of motherhood. It’s the hardest yet most magical role in the world and it’s so reassuring to know that we are all in it together and can lean on each other through it all. I hear we will survive, right?! ? ? I feel so blessed to do what I do with The BakerMama. Sure its been lots of late nights and early mornings and every minute in between all while raising my crazy crew and snuggling my hubby, but it’s my dream job and I love it so so much! I wish I could have each and every one of you over to bake with me and thank you for your love and support over the years! It means more to me than donuts and y’all know that’s A LOT! ? As I describe these muffins, they really say a lot about what The BakerMama is all about. It’s about easy delicious recipes that bring you and your loved ones together in a special and memorable way. And when I say easy, I mean easy with this recipe. We’re talking 4 ingredients and less than 30 minutes. I usually bake from scratch, but I’ve never been against a boxed mix. And one of my favorite ways to bake with a boxed cake mix is by totally ignoring the instructions on the box. Haha! Seriously though, take a boxed cake mix and add some fruit to it instead of the oil, water and eggs and you’d never believe it unless you were the one who baked it. My 2-Ingredient Baked Cake Donuts are another great example of a recipe that y’all rave about for its ease and tasty results. So it’s just a cake mix, mashed banana, applesauce and sprinkles. Still very much a sweet treat but with a healthier twist that makes them perfect for a birthday breakfast celebration. 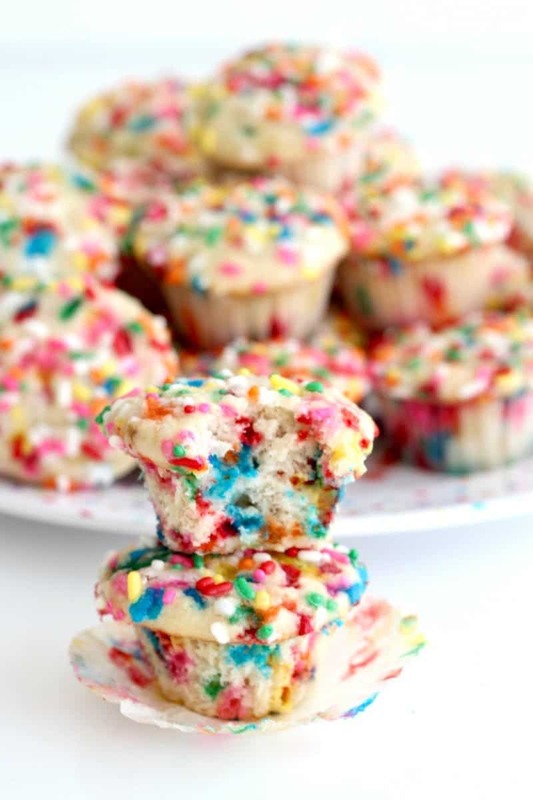 They have the texture of a moist tender muffin and the taste of birthday cake with a hint of banana. 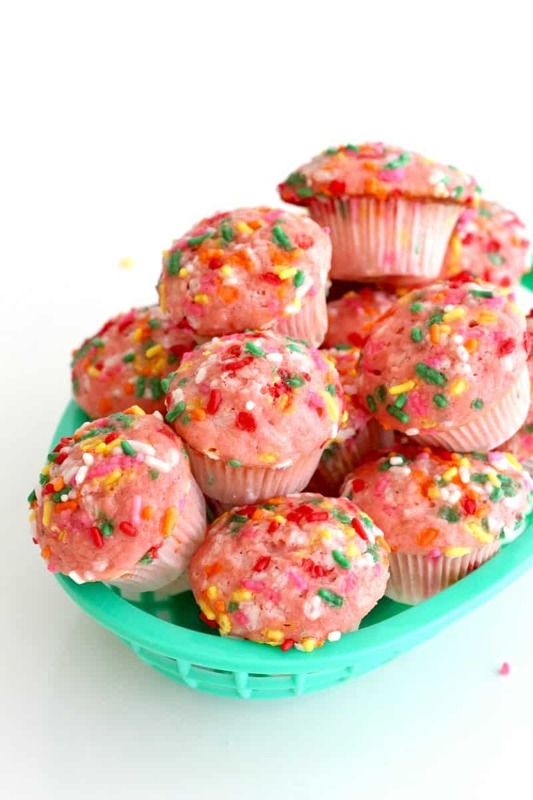 Or you can use a strawberry cake mix which makes them pink with strawberry flavor as well. Such a fun option! I made these birthday breakfast muffins for Baker’s birthday celebration at school and I can’t even tell you how excited everyone was about them. They’re mini so the kids each got two and then the teachers and the school staff were literally bumping each other out of the way to grab another and get the recipe from me. Lots of fun and yum going on with these breakfast muffins! So make someone’s birthday morning extra special, or any morning special for that matter, with these festive breakfast muffins. Here’s to The BakerMama and many more years of sharing great recipes as well as connecting with you about food, family, life and donuts. I love y’all! Preheat oven to 350°F. Line a 24-cup mini muffin pan with liners and spray with non-stick cooking spray. In a large mixing bowl, add the dry cake mix. Stir in the mashed banana and applesauce until well combined. 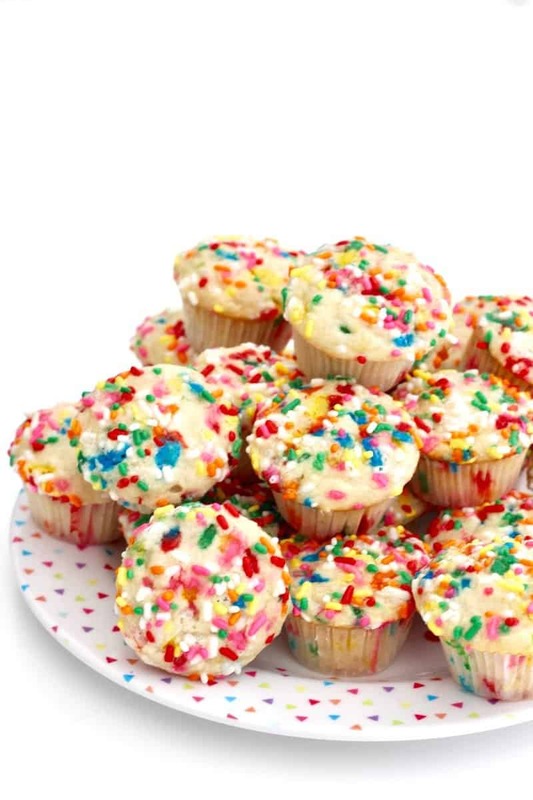 Fold in 1 cup rainbow sprinkles. Scoop batter evenly among prepared muffin cups. 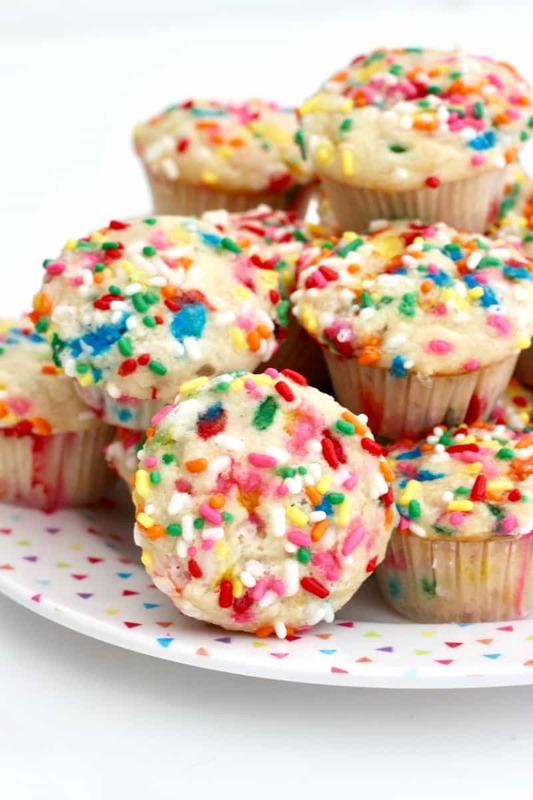 Sprinkle the top of each muffin cup with more sprinkles. Bake for 16-18 minutes or until muffins have risen and a toothpick inserted in the center comes out clean. Let cool in pan for 10 minutes before transferring to a wire rack to cool completely. Store in an airtight container.